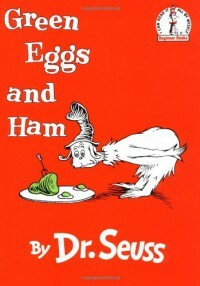 Dr. Seuss's Green Eggs and Ham is another classic children's book. This book is a fun read for young readers--whether they are just beginning to read or are advanced in their reading. The alliteration and rhyming is an added bonus to an already great book. Readers can familiarize themselves with rhyming and alliteration and these literary devices also keep the book fun and interesting. I would use this book in the classroom during a lesson on literary devices--specifically rhyming. I would ask students to play a rhyming puzzle card game where they must retell the story by matching rhyming word pairs. This would serve as a quick and fun review of the game but also practice rhyming.